I love the Awesome Fest peeps and this weekend they've rallied together a new event called CANCELLED!, which of course can be confusing because actual shows are canceled all the time. But despite all of that, you should really get your hands on tickets ASAP because I've never known an Awesome Fest event that didn't sell out in advance and it becomes exceedingly impossible to sweet talk your way into the shows without a wristband. The events are spread between Soda Bar and Space by night, and Bar Pink and The Office by day. Plus, it's super cheap and you've got a three day weekend so you'll have all of Monday to recover from the vast amounts of PBR consumed all weekend. Tickets are $25 for the whole weekend, but you have to buy before Friday (while they last!). Day passes are available, too, for $15 Friday, $20 Saturday, and $15 Sunday. 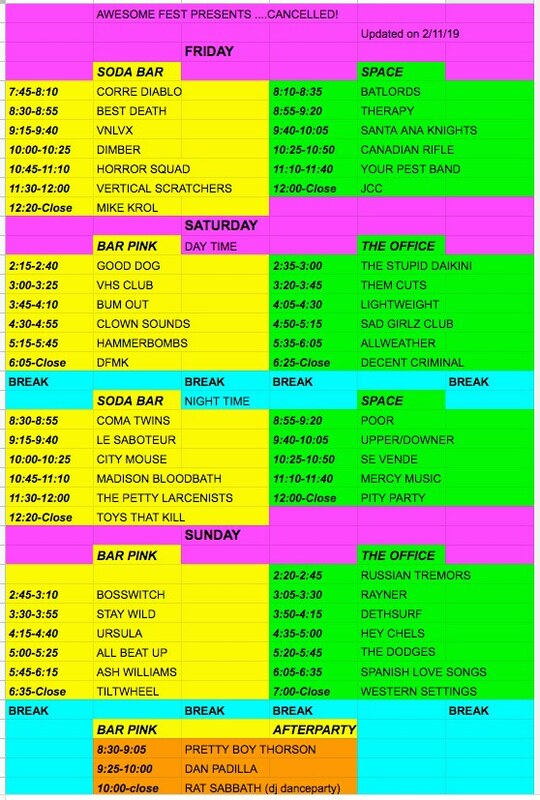 The full lineup and schedule is after the jump, but I also included lineups (without times) in the regular listings. Billie Eilish Returns! SOLD OUT!